CHRIST'S GENEALOGY IS OUR FAMILY TREE! Subdeacon Joshua holds an M.Div. (Masters of Divinity) degree in Pastoral Theology and Systematic Theology from Concordia Theological Seminary, and a Ph.D. (Doctor of Philosophy) degree in Systematic Theology from the University of St. Andrews in Scotland. Currently, he serves as Associate Professor of Historical Theology at SS. Cyril and Methodius Seminary in Orchard Lake, MI, and as an Adjunct Professor of Philosophy at Purdue University's North Central campus in Westville, Indiana. He also serves as a Chaplain for the Detroit Fire Department. Prior to entering the Holy Orthodox Church, Subdeacon Joshua served as a Lutheran minister for seven years. He and his wife, Abigail, and their four daughters are active members of St. Innocent Church. In the Name of the Father, and of the + Son, and of the Holy Spirit. Amen. It’s like this: hearing the Gospel read during the Liturgy should be like going on a safari. The stories are real. And the men and women by whom and for whom they were written actually experienced the things we hear. But this is the key: they were not only real then. These are not dead stories, repeated year-after-year as a history lesson. But these stories, what you hear every Sunday at Liturgy, these stories are as alive today as they were then. They are our stories. And they happened, not in the past, not 2,000 years ago in some far-off corner of the world, but they happen today, and they happen here. And that is especially true when it comes to this genealogy. This genealogy is not merely a history lesson. It does not merely show how God went from point A to point B. But this genealogy is our family story! And it is a genealogy filled with all sorts of saints and scoundrels, with all sorts of holy men and women, and even some seemingly hopeless cases. Yes, there are the Abrahams, Isaacs, and Jacobs, but there are also the Tamars, the Davids, the Bathshebas, and the Rahabs. There are the pious and the prostitutes, the angelic and the adulterers. But please don’t let that pass you by. The fact that these folks – all these folks – are included, is what this genealogy is all about, and it’s why we read it today, the Forefeast of the Nativity. Our salvation, you see, did not occur on some far-off planet, in some perfect little country, among some sinless, spotless creatures. But salvation occurred in our world, in a country fraught with danger and war and bloodshed and anger and hatred and crime, among people who look and act like our friends, our families and, yes, even like our very own selves. Broken, sinful, and even unfaithful – this is the lineage that God inherits. But that makes sense when you remember why He did it and why He continues to do it, year-after-year, coming again and again and again as the babe in the manger. He did it, and He does it, because He wants His people to be free – free to say yes to Him, not by force or coercion or some storybook lineage, but free to say yes to Him by entering into His story, and by finding in Him – in this babe of Bethlehem – all the love and friendship and hope they could ever imagine. you have in this genealogy, in this, your family tree, you have a friend, you have a hope, and you have a future. And if you don’t believe me, just remember how the genealogy ends: it ends with Joseph being visited in a dream. It is a strange thing, really. With the burden of the situation, we might excuse old Joseph if, on occasion, he felt anxious or insecure or even if he had second thoughts. Yet, the Gospels show us that this was not the case. In fact, each of the four times that Joseph appears in Matthew’s Gospel, he is sound asleep. Whatever troubles he endured, insomnia was not one of them. And that, of course, means something. A man who sleeps well is a man who is content. He is a man who is happy and free who, as the Psalmist says, “Lies down to sleep in peace...” He is a man who trusts solely in God and not in himself. He is, very simply, a man who knows his place in this story, and who can see in this list of names that he is not alone and he is not unloved. That is the beauty of this genealogy. 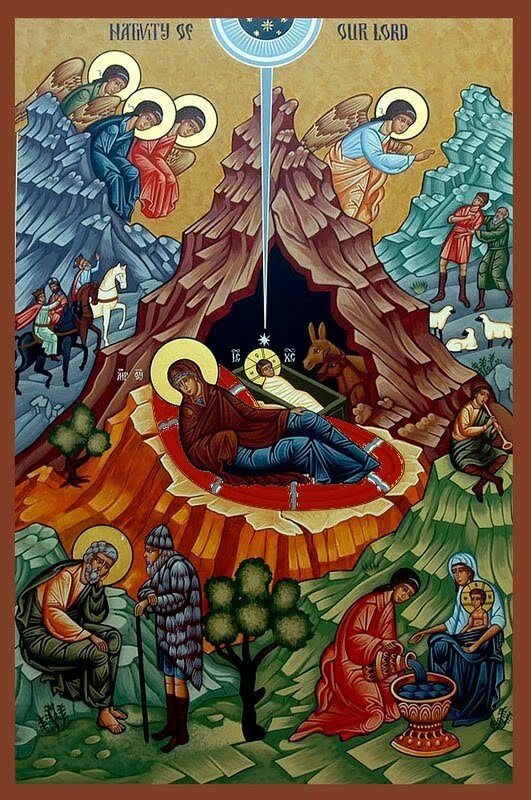 And that is the beauty of the Nativity—never alone and never unloved. And it is that kind of life that Christ desperately wishes for all of you today.